There are two different places I am looking to improve lighting my city. I display my city on a semi regular basis, at least 6 times a year and the biggest time consumption is to wire up all the lights. To help facilitate wiring I would like to see some quick connectors. The first connector would be used between floors on a modular. At first when we talked with Rob about this, the Apple Mag Safe connector was mentioned, but that may have IP (Intellectual Property) issues. The second thought I had was to something LEGO like. Maybe a 1xN version of the PF Connector. I would want to see 1x so we can hide the connector in the wall. The second connector I would like to see would be used between brick built roads. The idea I was thinking about is the stereo mini plug that would be in one side of the road and the other would be the socket. I *think* the socket can fit into a Technics hole. Both of these connectors would need to be able to stand up to regular plugging and un plugging. Stay tuned. Spent time in the lab working on the solution today-- everything is coming together in a way that I think will make a lot of builders very happy. Thanks Rob, I will be looking forward to seeing stuff at Cantigny! Hi Tom, thanks for pinging us on this. We're still working to finish the connectors, but this is the busiest time of year for us, and keeping other products in stock plus filling new orders is slowing the work on the connectors a bit. In the interim, I'd suggest wiring up your Modular with one "Y" adapter board either on the back of the building or on the ceiling of each floor-- this isn't as easy as using a magnetic connector, but it will allow you to disconnect individual floors and set the stage for swapping out that "Y" adapter later with the mag connector. 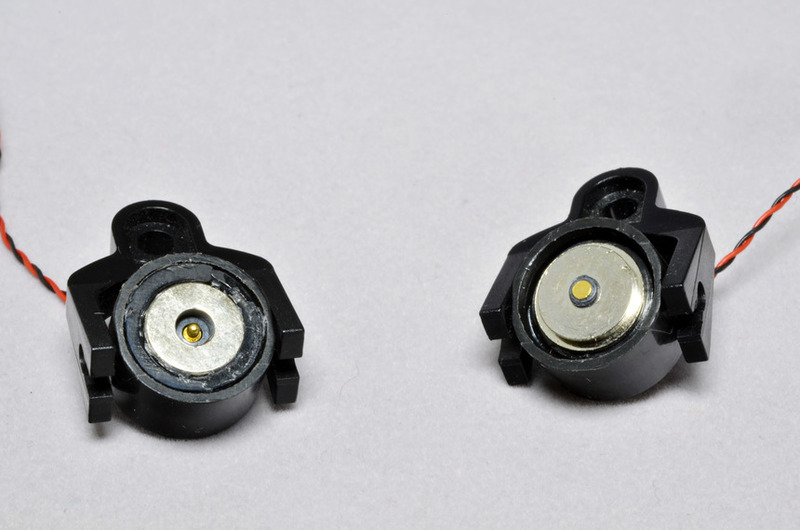 The mag connectors will have wires with standard-sized plugs on each end, so two modules (top and bottom) each with a short wire extending from the assembly. I hope this helps. Thank you again, and keep an eye on this thread for updates regarding the connectors! Thanks for your response! I see I get an e-mail when there's an update here, so that'll do fine. I already have my first floor wired up with a Y adapter indeed, just added a new floor with no wiring yet, so was holding off a bit to see what would be possible in the future. How will the mag connector work? Is it like a regular lego brick? Tom Laermans We're planning several options, one of which is mounting inside a standard brick. 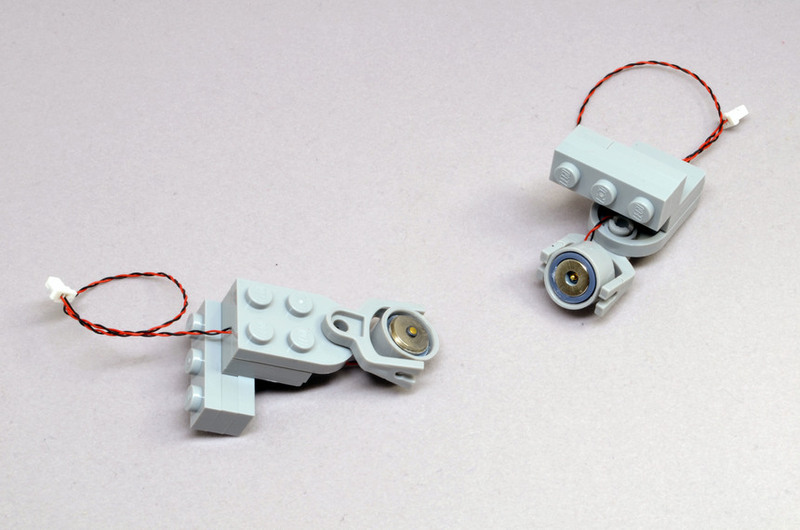 We know the system needs to conform to LEGO stud geometry so it will integrate seamlessly with builds. Tom Laermans We have the magnets in house and we're waiting for the cables. They're scheduled to arrive at the end of February, after which we can begin assembly. Stay tuned! We sold these at Brickworld Chicago in June, and we will have some with us next week at BrickCon Seattle. Price is high (the horizontal models use original LEGO 9v train couplers from the 1990s, which are extremely expensive to obtain). Plus with both designs, the time required to manufacture and test is extremely high. The horizontal models are $44.99 for 2 pairs, and the vertical models are $22 for one pair. Space required is large. Especially for the vertical mounts, there is a large amount of room required inside whatever structure you'd like to connect. In some models, there was insufficient room inside to accommodate the design. We can still make horizontal and/or vertical sets. If you're interested in purchasing some just let us know. We're also working on some new designs that take up less space and which may cost less. Once we get stable prototypes, I'll post some photos here. So, the quest continues! Thanks again for continuing to poke us-- keep it coming! Tom Laermans Agreed, thanks for the feedback. We're continuing to experiment-- not giving up on the need to have friction connections. Stay tuned. I could use this option also. If I can make a suggestion, I think the interface should designed to work well with the Modular Integrated Landscape Standard (MILS) and have a contacts to complete 4 circuits, this would allow a lighted creation to work with Brickstuff newer 4 channel system control. Channel 1 ground level, 2 street lights, 3 flicker and 4 upper floors. Maybe using an interface designed somewhat like a Technics brick 1X1 with each hole having connectors to complete one circuit. Pins with metal conductors could complete the circuit between MILS modules. 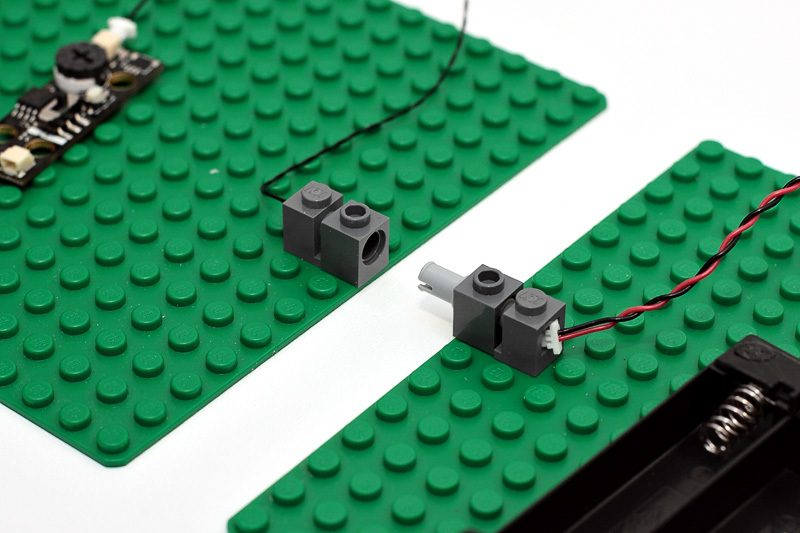 Four of these brick interfaces side-by-side, in two adjacent MILS modules could deliver 4 channels between the two MILS modules or pass current on to other MILS modules. Bricks could be color coded to represent the four channels. I'll try to create a representation in LDD and post it. The pair of 1x1 bricks on each plate would actually be a single 1x2 brick. The back of the brick would have a socket for standard Brickstuff connection wires. 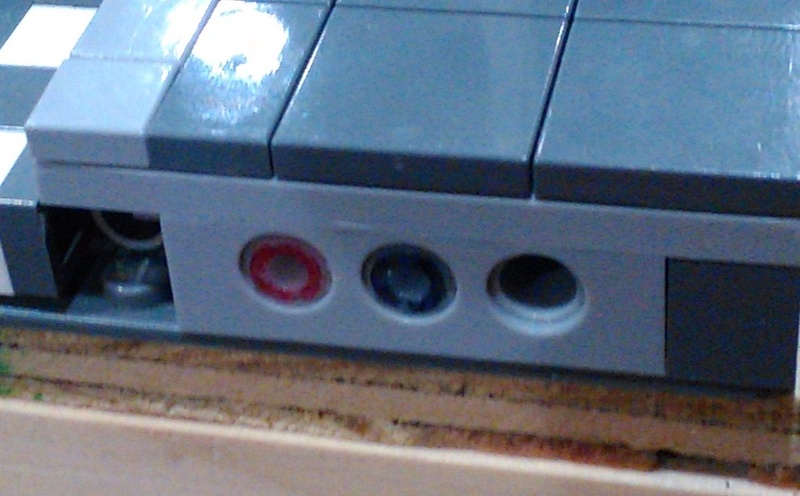 The front of the brick would have some sort of 2 conductor tip sleeve contacts. 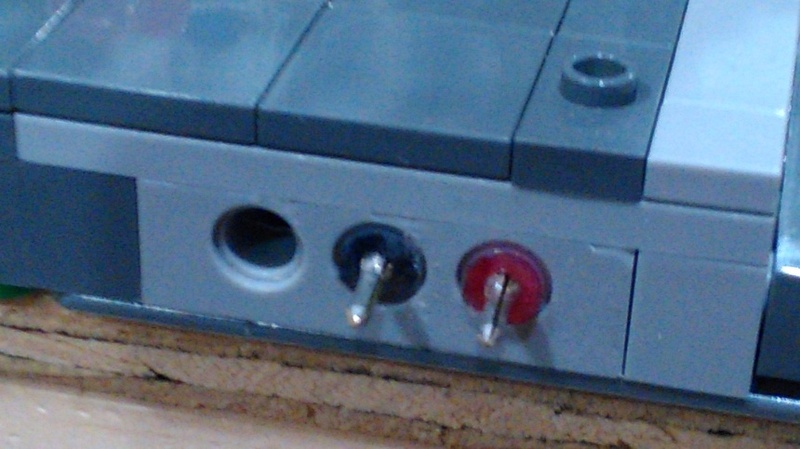 A two conductor pin would plug in and connect two MILS modules, but wouldn't fit as tightly as a standard LEGO pin. Multiple pairs of these bricks would allow you to have a multiple MILS creation that could have multi-channel wiring self contained in each module. Then be broken and down for travel and set up for display. You could sell 4 packs of color coded pairs for four channels and maybe a generic gray for anything beyond 4 channels. I presented my solution to brick built roads at BW this past year. I too used a 4 stud wide connector but I was only able to get 1 circuit. The problem I think with your design is having the connection as a coax connector is that the coax connector doesn't scale that small. Think thin-net (10Base2) and thick-net (10Base5) connectors. I can conceive of a second circuit in my design by using the common return. 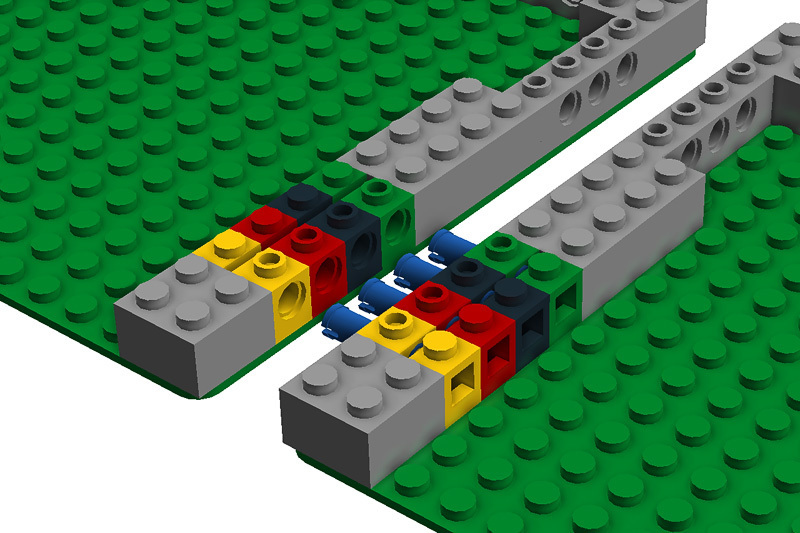 The other idea is to use a non LEGO formatted connector in the 1 x 4 space to get more circuits. I have not researched this yet. With your pin layout SkyPirate we can do 3 circuits having a common return or two isolated circuits. SkyPirate thanks for the ideas-- it's great to have the visual representation. Definitely something for us to consider. The challenge is finding a connector with two conductors inside a single round mount, something that could fit inside the Technic pin in your diagram. We are continuing to experiment with connectors that can fit inside a 2x2 brick with an extra plate underneath-- unfortunately this doesn't align perfectly with standard geometry, though it can be made to work if planned for ahead of time. We are very close to announcing a new and much more elegant solution for vertical connections-- stay tuned in early 2018 for that. Horizontal connections are still something we're experimenting with. Again, you've put a lot of thought into your plan above, and it's definitely helpful! Thanks again for sharing.